Okay, don’t laugh – this is very delicious! It’s an Moka Frio Oreo* Frappé from the Italian Coffee Company. They have two locations in Los Cabos – one in the Puerto Paraiso and one at a gas station stop along the Corridor. There’s a bunch more throughout Mexico (almost like a Mexican Starbucks!). 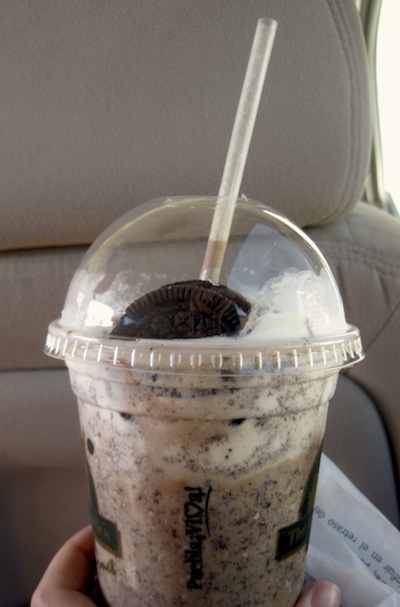 I first became addicted to this Oreo Frappé last summer when we were staying in San Jose del Cabo for the month of July. Each time we drove to Cabo San Lucas, we stopped at the Italian Coffee Company and got ourselves Oreo Frappes. Now, this Oreo Frappe is one of my favorite things to go back to Cabo and get. I’m not sure how many calories are in it… and I hope no one ever tells me! What’s the thing you HAVE to HAVE when you visit Cabo? *Oreo is a registered trademark of Kraft Co.